One of the enduring critical issues of societies across time is how to care for those in need. Who is responsible for providing care? Who is responsible for funding it? We know that charitable giving isn’t evenly spread across the nonprofit sector. What can published accounts tell us about what Americans consider less worthy of donations? 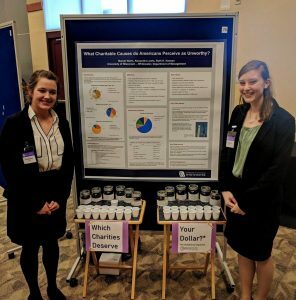 Over this academic year, students Alexandra Lewis ’18 and Mariah Navis ’19 have been working with Dr. Ruth Hansen to replicate a study first done in the United Kingdom by Dr. Ali Body and Dr. Beth Breeze, using published accounts as a proxy to determine which charities and causes are considered unpopular or unworthy by the general public. Alex and Mariah presented the study’s preliminary results at the UW-W Undergraduate Research Day on March 21. Preliminary findings show some differences between the list generated by reviewing UK media and the one reviewing US media. For instance, US articles identified Confederate heritage as an unpopular cause. Articles on the topic started appearing in 2015, after a mass shooting in a historic black church in Charleston, SC prompted national debate on displaying the Confederate flag and other monuments to the Confederacy. Mariah and Alex will also present preliminary findings at the system-wide undergraduate research symposium, held this April at UW-Green Bay. The research team plans to conclude analysis this spring. Today we have a guest post from Bryce Lord, Associate Director of the Helen Bader Institute for Nonprofit Management. 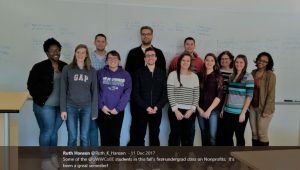 As we approach spring break and those graduating are looking for their post-UW job, Bryce announces a Wisconsin-wide resource for nonprofit employment opportunities. The Helen Bader Institute (HBI) for Nonprofit Management at the University of Wisconsin – Milwaukee is proud to offer the Wisconsin Nonprofit Career Center – the premier resource in Wisconsin to connect nonprofit career opportunities with highly qualified talent throughout the state. Formerly hosted by the Wisconsin Nonprofits Association, the Wisconsin Nonprofit Career Center offers a wide range of resources for both the nonprofit job seeker and employer. Search and apply to the best nonprofit jobs at institutions that value your credentials! Upload your anonymous resume so employers can contact you – while you maintain control of your information and choose to whom you release your information! Post jobs where the most qualified nonprofit applicants will find them. Email your jobs directly to WI Nonprofit job seekers via our exclusive Job Flash email. From Milwaukee to La Crosse, from Madison to Superior – finding the right employer to employee connection is a vital part of a positive hiring experience. HBI recognizes the need for a broad-ranging resource that works to connect nonprofit jobs and job seekers across the Wisconsin nonprofit sector. Thank you for all the good work you do across Wisconsin! We’re pleased to announce the lineup of events for our second annual Nonprofit Organizations Week! This year combines research findings presented in collaboration with the Helen Bader Institute for Nonprofit Management (UW-Milwaukee), a film and discussion presented in collaboration with our colleagues in Arts Management at UW-W, and a panel of local nonprofit professionals discussing careers in the nonprofit sector. We hope you can join us at one or more of these events! What do city officials see as public health issues in their communities? Do they think local government and nonprofits are able to respond? Presentation of original research. How do arts management professionals contribute to a theatrical production? 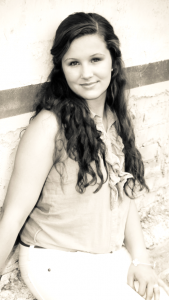 Emily Ottinger, UW-W ’18, Stage Manager and Company Manager for Milwaukee Ballet, will join the discussion. A panel of professionals discusses the varied careers available in the nonprofit sector. Events are free and open to the UW-Whitewater community! Last week UW-Whitewater Nonprofit Management faculty Carol Brunt and Ruth Hansen traveled to Amsterdam, the Netherlands to present research papers at the biannual conference of the International Society for Third-Sector Research . Dr. Brunt’s presentation, Advancing a “People-First” Culture: Human Resource Management in Nonprofit Curricula, assessed the inclusion of human resource management in American nonprofit management education. Dr. Hansen’s presentation, Unpopular: Examining the Role of Client Stigma in Writing Charitable Appeals, looked at evidence of fundraising practice for different nonprofit client groups. The conference was hosted by the Philanthropic Studies department of Vrije Universiteit Amsterdam, and allowed for discussion among 600 scholars of nonprofits and philanthropy from around the world. Dr. Brunt and Dr. Hansen joined colleagues in visiting some of Amsterdam’s nonprofits, including the Rijksmuseum, the Van Gogh Museum, and the Anne Frank Museum. To learn more about nonprofit management at UW-W, visit our webpage. You can also follow Ruth on Twitter: @Ruth_K_Hansen . Did you know that approximately ten percent of people employed in the United States work for a nonprofit organization? And that that number exceeds 12% here in Wisconsin? That the nonprofit sector contributes more than $900 billion to the U.S. economy? The nonprofit sector is a big deal! Foundations in Nonprofit and Nongovernment Organizations (MGT 370) Our initial nonprofit management course examines the scope and impact of this growing sector, as well as its relationship to business and public sectors. Public Policy Analysis and Advocacy (POLISCI 330) Offers a systematic introduction to the study of public policy through an analytical problem-solving approach as well as examining other models and approaches across sectors. Cooperative/Internship in Management (MGT 493) A practical internship course, offered as a constructed-supervised work experience within the major area of concentration of the student. The internship experience offers the student an opportunity to participate in day-to-day activity in nonprofits. It is supported by an online credit course. Currently, Management 370 is offered every fall. PoliSci 330 and Management 493 are offered every semester. Our faculty members bring practical experience in a variety of nonprofit settings, as well as expertise and research into aspects of nonprofit management. Watch this space for a series of articles on what each member brings to the UW-W Nonprofit program. UW-W CoBE is a member of the Nonprofit Academic Centers Council. To learn more about the Nonprofit Management emphasis, contact Dr. Carol Brunt at bruntc@uww.edu . When I first came to UW-Whitewater as a freshman, like most of my peers, my degree was undeclared. I knew I had an interest in people, specifically how they internalize their environment, justify their worldview, and how this influences their relationships to others. I had a desire to understand people with backgrounds unlike my own. I started in psychology, dabbled in sociology and theology, and eventually fell into the business school. Now I am in my final year pursuing a major in general management. Management offers job versatility across all industries, and yet, I am still unsure which direction this education will carry me. I was ecstatic when the course Foundations of Nonprofit & Nongovernmental Organizations became an option for my senior electives. To understand people, their needs, goals, and their own purpose of life is important to me. I want to help those individuals that otherwise might not have been given a chance to be heard, and I, in the meantime, will make the personal connections and experiences I would not find anywhere else. The scope of the non-profit sector is vast, but wielding my education as my weapon, I hope to find my place in it. 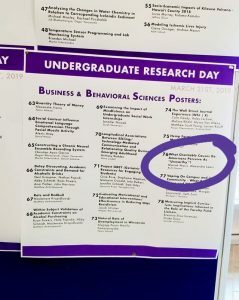 The College of Business and Economics (CoBE) at the University of Wisconsin-Whitewater began laying the groundwork for a nonprofit and nongovernmental program in its Department of Management in 2014. Our first faculty member, Carol A. Brunt, Ph.D. was hired in 2015 to initiate program development. Dr. Brunt has professional experience in international development and environmental NGOs, especially on the African continent. Both courses provide students with foundational knowledge of the NPO sector. Initial student feedback has been enthusiastic, and with the introduction of an undergraduate emphasis in Nonprofit Management as one of the options for the General Management major, nonprofit education has officially joined UW-W’s Management curriculum. Our program team also includes Megan Matthews, MFA. Ms. Matthews has a professional background in fundraising and in arts management. Together, we are focusing on well-founded program development, including curriculum design, course instruction, student inquiries, community partnerships, and interdisciplinary projects. Next up: developing an undergraduate major in Nonprofit Management, guided by the NACC curriculum recommendations. Building on current strengths, we will start by focusing on HR management, leadership, grants management and fundraising. The research agenda of our program team focuses on aspects of nonprofit management, using multiple research methodologies. Dr. Brunt examines strategic human resource management (SHRM); career development and adult learning theory; and social unionism in the nonprofit sector. Ms. Hansen researches fundraising, focusing on individual fundraiser agency, communication, and socially marginalized client groups; donor behavior; and policy and regulation of nonprofits. Our diverse interests, experiences, and multidisciplinary approaches lead us to eagerly anticipate collaborative, dynamic programming within our fledgling Nonprofit Management program. This past year, CoBE sponsored its first Nonprofit Week on campus, featuring a research presentation by Doug Ihrke and Crystal Mederies Ellis of the Helen Bader Institute (HBI) at UW-Milwaukee, and a panel presentation on Careers in the Nonprofit and Public Sector. In February, we’ll be presenting in HBI’s Colloquium Series at UW-Milwaukee. Both Dr. Brunt and Ms. Hansen moved to Wisconsin recently, and are enthusiastically getting to know the nonprofit community in southeast Wisconsin. This includes site visits with local organizations, as well as engaging with local chapters of associations serving nonprofit professionals. Ms. Matthews is a Wisconsin native, and is active in integrating arts in communities across the state. 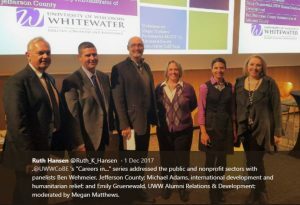 Follow us on Twitter at @Ruth_K_Hansen and our blog at Nonprofit@UWW. Powered by WordPress with Pool theme design by Borja Fernandez. Theme pack from WPMUDEV by Incsub.